One of the fun aspects of having wee copies of yourself running around the house is that you get to reread your favorite examples of children’s literature. Lately, I have been performing Anne of Green Gables for the girls before bed, which has helped me crystallize my thoughts on another popular series for kids, Harry Potter. The entire time that we read the magical tomes to the girls, I couldn’t escape the thought that while her world building and story arc were admirable, Ms. Rowling’s writing skills simply didn’t measure up to the classics that I enjoyed in younger days. LM Montgomery transforms Anne’s everyday life into an adventure that has the girls on the edge of their seat…well bed, and she does it with a flowing and poetic voice that is mesmerizing. It makes me admire her all the more that a book published in 1908 (it was her first novel) can capture my daughters’ imagination so completely, with nary an exploding wand to move the action along! Mr. Phillips was back in the corner explaining a problem in algebra to Prissy Andrews and the rest of the scholars were doing pretty much as they pleased, eating green apples, whispering, drawing pictures on their slates, and driving crickets, harnessed to strings, up and down the aisle. 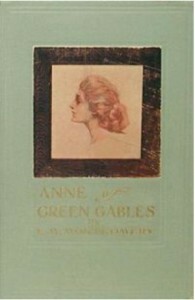 Gilbert Blythe was trying to make Anne Shirley look at him and failing utterly, because Anne was at that moment totally oblivious, not only of the very existence of Gilbert Blythe, but of every other scholar in Avonlea school and of Avonlea school itself. With her chin propped on her hands and her eyes fixed on the blue glimpse of the Lake of Shining Waters that the west window afforded, she was far away in a gorgeous dreamland, hearing and seeing nothing save her own wonderful visions. Gilbert Blythe wasn’t used to putting himself out to make a girl look at him and meeting with failure. She should look at him, that redhaired Shirley girl with the little pointed chin and the big eyes that weren’t like the eyes of any other girl in Avonlea school. And then — Thwack! Anne had brought her slate down on Gilbert’s head and cracked it — slate, not head — clear across. This entry was posted on Sunday, August 30th, 2009 at 9:29 am. You can follow any responses to this entry through the RSS 2.0 feed. You can leave a response, or trackback from your own site. I never read the Anne of Green Gables books, but I remember the Mary Poppins series as a child. Brilliant, creative writing. Totally ruined by the sappy Disney film. You know, I’ve always meant to read the original books. But my generation was raised on the movie, and for some reason, I never got around to the book. It would be fun to read with the Zs and see what the differences are. In general, with the girls, we try and have them complete the book before seeing the movie, if one exists! you should also edit out the part about crickets on a string. it might not be as bad as flirting with boys, but cruelty toward insects is no laughing matter. ah…how right you are. i have found it difficult to find “good” literature that is worth reading to the children without going back to the classics from our youth. have you ever read the Penderwick series (only two books in the series). Not an old one but a relatively decent book from today. We’re always excited to hear of a new series for kids, and had not heard of Penderwick. We shall check it out!